Vance, Donald R., George Athas, and Yael Avrahami, eds. 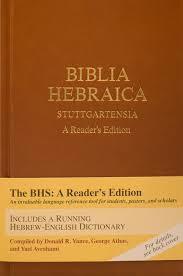 Biblia Hebraica Stuttgartensia: A Reader’s Edition. Peabody, MA: Hendrickson Publishers, 2014, pp. xxxv + 1765, $59.95, hardback. Donald Vance (Ph.D., Denver University-Illiff School of Theology) is Associate Professor of Biblical Languages and Literature at Oral Roberts University in Tulsa, Oklahoma. George Athas (Ph.D., University of Sydney) is Director of Postgraduate Studies and Lecturer in Old Testament, Hebrew, and Church History at Moore Theological College in Newtown, Australia. Yael Avrahami (Ph.D., University of Haifa) is Chair of the Biblical Studies Department at Oranim College of Education in Tiv’on, Israel. In addition to the present volume, Vance, Athas, and Avrahami collaborated with Jonathan Kline (Ph.D., Harvard University) to create another reader which focuses on the Aramaic portions of the Hebrew Bible, which is entitled Biblical Aramaic: A Reader & Handbook (Peabody, MA: Hendrickson, 2017). By modifying the footnotes of the traditional Biblia Hebraica Stuttgartensia, Vance, Athas, and Avrahami have attempted to provide a resource that hurdles the barriers which many new readers of the Hebrew Bible (HB) face. These issues include the daunting vocabulary of the HB, difficulty in parsing certain verbs (like ones with weak roots), and the necessity to have multiple volumes at hand to simply translate a text. Many have turned to Bible software to overcome these obstacles; however, one finds that the learning process is cut short because of the crutch that this technology too often becomes. I believe that the components brought together in this work present a better alternative for the reader of the HB. First, an assessment will be made of what I would consider the positive features of this volume. One of the most obvious reasons to publish a reader edition is the need for quick access to the vocabulary of the HB while one is reading the text. The editors have created footnotes with vocabulary glosses for every word occurring less than seventy times in the HB. Since choosing a translation amidst a semantic range can be daunting for a new student, each gloss is contextually sensitive to the passage at hand. Moreover, for those that need a vocabulary review, every word that occurs seventy or more times in the HB is found in a glossary at the end of the book. Meaning, in theory, every word in the HB can be translated without the need to page through a separate lexicon. Another feature is the parsing guide, which coincides with the glosses in the footnotes. The editors have created their own parsing code by modifying the existing system found in Lasor’s Handbook of Biblical Hebrew (Grand Rapids: Eerdmans, 1989). Every word which occurs less than seventy times in the HB is parsed in the footnotes, which includes nouns, adjectives, and prepositions. In addition, words that are of higher frequency, but have weak, irregular forms are parsed as well. Provided in the introduction is this example of what the glosses and parsing look like for Leviticus 1:15– “aHr10s0 קרב. bGr10 מלק wring. cNr10 מצה be drained.” (p. xiii). This is the standard format throughout the volume. Next is the presentation of the text itself. For most of the narrative texts, the translator will not notice a difference from the original BHS or any other reader edition. However, the aesthetic grace of the poetic and prophetic texts is where this book truly becomes an efficient “reader”. Every translator who has picked up a BHS knows that one of the most difficult obstacles to overcome when translating poetry or an oracle is that the ability to determine where clauses begin and end does not come naturally. Even the narrow divisions in most BH texts are not enough to allow for fluid reading. To help the translator, the editors have separated poetic and prophetic texts into their respected clauses and have given visual cues to allow for a more enjoyable reading experience. In fact, I tested this out on myself and could easily read through the entire Psalter in an efficient time. This was in large part because of the stanza divisions and how my eyes were not fatigued by looking at an endless wall of evenly spaced Hebrew words. The final positive feature is found just before the glossary. Every major verb and noun paradigm is given as a point of reference for the translator. Again, just like the glossary, the translator can answer most of their paradigm questions in one place without spending time looking for solutions in a beginning or intermediate grammar. Now that the four main positive features have been evaluated, I must offer two caveats to the translator and mention the places where one could have issues. First, the nature of a reader’s edition dictates that the traditional text-critical apparatus is replaced with vocabulary glosses. Therefore, if one wants to analyze manuscript variants according to the apparatus of the traditional BHS, then it cannot be done in this volume. An additional place of potential shortcoming is the complexity of the parsing guide. Although it is a fantastic help, unless one is already familiar with the parsing system found in Lasor, it does require that the translator learn a new way to identify something that is already parsed. For the first few weeks, the translator will want to keep the bookmark with the parsing codes provided at hand. In defense of the editors, I do believe that the decisions made for the overall effectiveness of the volume outweigh the potential downsides. The textual apparatus of the original BHS is antiquated. Therefore, the translator does not miss much in terms of losing the textual apparatus. Moreover, learning the parsing system does take time, but it is well worth it because the information does foster an efficient translation experience. Overall, I believe that this should be the standard HB that instructors use in an intermediate Hebrew course. The information given can be understood by anyone who has had two semesters of Hebrew, and it is nearly perfect for sight reading and translating. Unlike most electronic software, this book does not enable habits that undermine the learning process. This does not, however, mean that one will lose time translating in comparison to software, especially once the parsing system is mastered. Any student of the HB will want this book on his/her shelf.